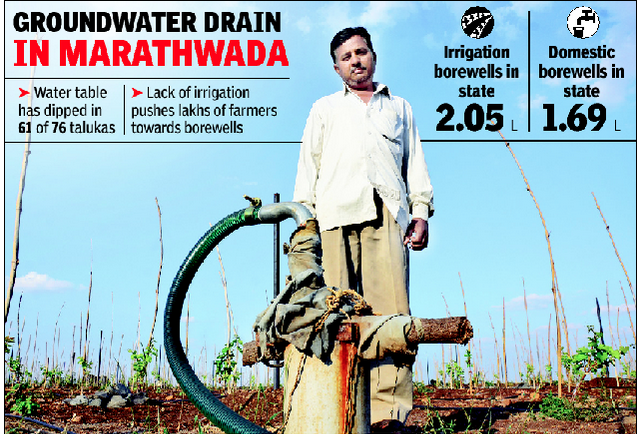 The rapid development, coupled with absence of ground water regularity measures resulted in depletion of ground water resources in some part of the Marathwada region. In such a scenario there is an urgent need to judiciously manage and efficiently regulate these precious resources. In the central and north western part of Marathwada region the post monsoon water level ranges between 5-10 m. These are the area where the ground water scarcity is quite common when rain fall is deficient. The ever increasing demand of domestic, industrial and irrigation needs have laid stress on ground water resources. Hydro-geological mapping of micro-water bodies i.e. natural ponds, lakes, farm ponds, check-dams helpful in controlled development of water resources and also to enhance ground water resources . Openly available satellite imagery of Landsat-8, FOSS4G tools offers its best in achieving this challenges. In collaboration with Swami Ramanand Teerth Marathwada University, KAIINOS brings out a platform SUJAL which integrates spatial spread of available water bodies derived from satellite imagery. It helps in temporally monitoring water availability in this region. It is helpful to the stakeholders in effective management of available water by preparation of water-budgets. Student volunteers will be using Open datasets to update the water body status every month. A lab has been set up for this purpose by the university. This acts as a resource center for government departments and not for profits to get access to technology and information. Remote Sensing and GIS (RS&GIS) together offer to map - monitor - manage the available surficial water bodies. FOSS4G tools offer to derive water bodies from satellite imagery provided by Landsat of USGS, Sentinel of ESA for every 16 days and 15 days respectively. These temporal derived data-sets of water bodies serves in effective management of available water for various respective purposes. Locating potential groundwater targets is becoming more convenient, cost effective than invasive methods and efficient with the advent of a number of satellite imagery. The nature of remote sensing-based water exploration is to delineate all possible features connected with localization of groundwater. Data, driven out of remote sensing, support decisions related to groundwater management. Hence special attention is required in Marathwada region and immediate steps like water augmentation by artificial recharge practice and water conservation should be adopted. Surficial water bodies derived using Normalised differentiate water index (NDWI) run of temporal satellite imagery, helpful to its stake-holders in ease of managing them at its various respective disciplines, such as lake-management, water-budgeting for livelihood practices, land use and land cover change analysis, flood prediction and various natural resource evaluations as well. Here for an instance, water bodies been extracted from Landsat-8 satellite imagery of summer (April) and winter (October) seasons of 2016, 2017. The results infers that very few number of water bodies were present in month of April 2016 as compared to that of in April 2017, the striking feature river is observed dry at various intervals in month of April 2016, where as river is observed with full of water in October 2016 and 2017. The study concluded that the lowering of water levels at pre and post harvesting are observed by NDWI calculations for various months, the study recommend to adopt the water harvesting methods. The continuous study at regular intervals will enhance and helpful in effective management and monitoring of water availability.The overall objective of the extraction of Water Bodies of Marathwada region is to ensure appropriate recognition and management of Marathwada region water bodies. Briefing about SUJAL by Mr.GOWTHAM, KAIINOS, IIIT Hyderabad. its very useful specially for Marathawada region. its helpful for sort out water problems of this or any area. good job team earth sciencs SRTMU Nanded.